While you're gazing at Chocolates and Gifts, why not sweeten that gift by including aromatic fresh flowers? The Divas have thought of it all. They love roses and recognize that others do too. 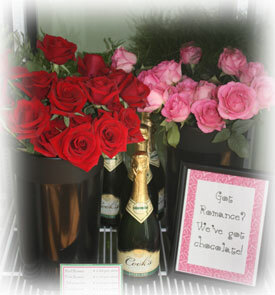 They will provide you with a fresh assortment or a subtle single flower. Got romance? We've got chocolate and flowers! Perfect for anyone who wants to add a special something to a gift for that special someone. Flowers say it best! With free parking available curbside right in front of the store, it's a convenient and easy stop.